Charlie Gard will be kept on life support until his parents' appeal can be considered, the Supreme Court has ruled. A legal agreement with Great Ormond Street Hospital, where the nine-month-old receives 24-hour care, had been due to run out at midnight on Wednesday. Supreme Court justices sit on 8 June to consider whether to hear an appeal from parents Chris Gard and Connie Yates. They had raised £1.3m to send him to the US for a trial treatment. Charlie has mitochondrial depletion syndrome, a rare disorder that affects the genetic building blocks that give energy to cells. His parents failed in their appeal against a High Court ruling that Charlie should be moved to palliative care. Great Ormond Street Hospital said Charlie's condition has left him unable to see, hear, make a noise or move. Last month, High Court judge Mr Justice Francis concluded life-support treatment should end. Charlie's parents, from Bedfont, west London, had asked three Court of Appeal judges to overturn Mr Justice Francis's decision - but the ruling was upheld. 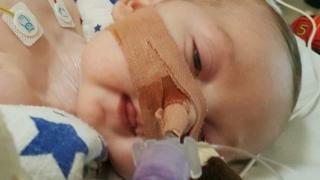 The hospital had argued Charlie was "a terminally-ill child" whose health was "deteriorating day by day". A spokesperson said: "Both the High Court and the Court of Appeal have decided that it is in Charlie's best interests for treatment to be withdrawn. "We have been asked to continue to provide treatment until the Supreme Court meets and we respect that wish." Supreme Court justices said on Wednesday they would consider analysing the couple's case. Britain's Highest Court will only grant an appeal on an "arguable point of law". If permission is granted, a date for a full hearing will be set.